A newly performed experiment by quantum physicists now proves that two observers can experience different, conflicting realities. What does this mean for bringing “The Event” and 5D Earth into fruition? 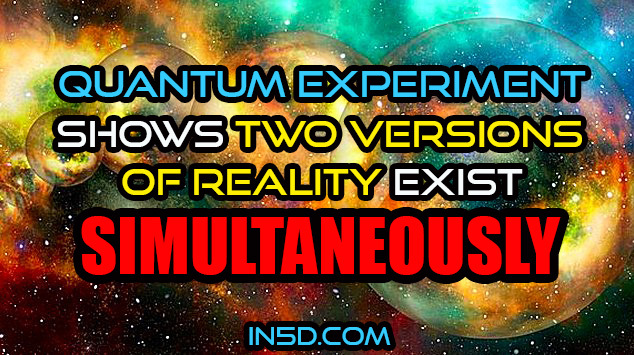 A theoretical experiment in 1961 by physicist Eugene Wigner, basically proposed that two observers will see two different realities. This experiment was never quantified until now. From wiki: Wigner’s friend is a thought experiment in theoretical quantum physics, proposed in 1961. The scenario involves an indirect observation of a quantum measurement: An observer W observes another observer F who performs a quantum measurement on a physical system. The two observers then formulate a statement about the physical system’s state after the measurement according to the laws of quantum theory. However, in most of the interpretations of quantum theory, the resulting statements of the two observers contradict each other. This reflects a seeming incompatibility of two laws in quantum theory: the deterministic and continuous time evolution of the state of a closed system and the probabilistic, discontinuous collapse of the state of a system upon measurement. Wigner’s friend is therefore directly linked to the measurement problem in quantum mechanics with its famous Schrödinger’s cat paradox. Last year, this test was conceived to be possible via advanced theory in quantum physics through lab results from real-time experiments that create different realities for comparison. This year, the experiment was performed for the first time by Massimiliano Proietti, et al at the Heriot-Watt University in Edinburgh. They concluded that realities can be made irreconcilable, making it impossible to agree on objective facts about the experiment, thus proving Wigner correct in his theory. For more on the science behind Wigner’s Friend, read this and this. What does that mean to us right now? If two realities exist at the same time, and time doesn’t exist, then EVERYTHING is happening all at once. In other words, everything that is possible is happening right now. Which reality do we choose to live in? What are we co-creating? I often think about this when I’m on my Walk of Gratitude. I’ll see a lot of people on the beach and will wonder how many of them are real, how many are NPC’s (Non Player Characters), how many are background people, and how many are simply co-creating this reality with me. We know that different realities exist at different vibratory levels called dimensions. As we transition from 3D to 4D, we’re seeing that thoughts manifest quicker than ever before. A few of us are “First Responders” who are the ones who see things before they happen. We all get these messages eventually, but a few of us are able to get these messages from the aethers a little before everyone else. This is no different than electricity being “discovered” at the same time all over the planet, without anyone being able to confer with the other people about their inventions. These ideas exist in the aethers, where time doesn’t exist and all future possibilities are available to the “First Responders”. Knowing what we know about the results of this quantum physics experiment, the more we focus on our new reality, the more it comes to fruition. This is why the mainstream media keeps us in a low vibratory level when broadcasting the news. Have you EVER felt good after watching the news? Neither have I. This is how we bridge into New Earth from our current reality which I call “alternate” Earth. We just need to vibrate in a different/higher way in order to achieve New Earth. And to learn how to transit between the two realities in a graceful way (building a bridge in your heart space that allows the transit between them). The Event will happen. Whether it’s sooner or later is up to us. As for me, that’s where my energies are focused! Who’s with me?